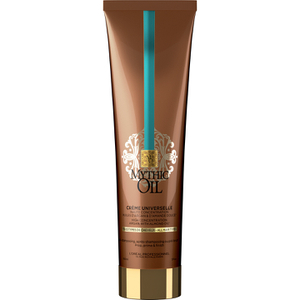 L'Oréal Professionnel Mythic Oil Crème is inspired by the oiling tradition of ancient Grecians, who coated their hair in oils for protection and replenishment. The 3-in-1 crème works effectively as a pre-shampoo, detangling rinse-off conditioner and blow-dry cream, providing 96 hours of volume control. 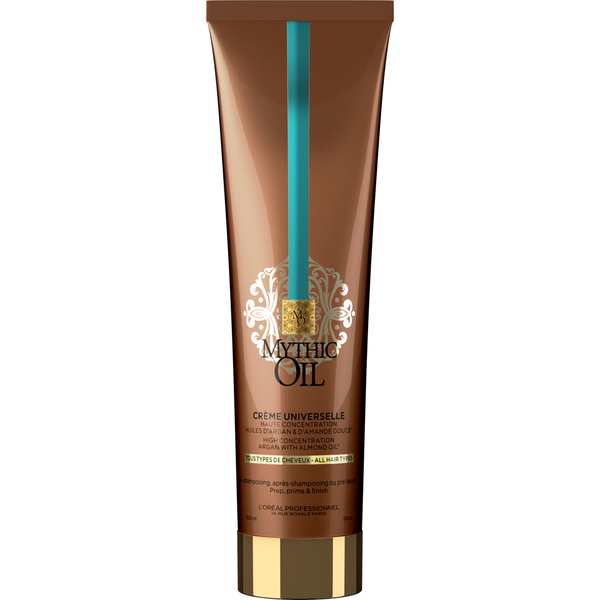 The Mythic Oil Crème is highly concentrated with fairly traded argan oil enriched with Vitamin E, renowned for deep nourishment. The treatment is also infused with almond oil, popular for its soothing and softening properties, providing emollience and a healthy glow. The creamy balm glides onto the hair providing a nourishing feel and smoothing the hair fiber. Blow-Dry Cream: Apply a small amount to three sections of damp hair, do not rinse and style as normal. Citronellol, Geraniol, Isoeugenol, Ci 19140 / Yellow 5, Coumarin, Parfum /Fragrance.